In addition to several individual honors, The Journal claimed a first-place sweepstakes award in its division of state college newspapers. The Journal, Webster University's student newspaper, won 26 awards at the Missouri College Media Association’s (MCMA) annual conference held at Southeast Missouri State University in Cape Girardeau. Webster's student newspaper claimed both a first-place sweepstakes award in its division of state college newspapers as well as a second-place award as the best overall student newspaper in the state. Webster University School of Communications professor Don Corrigan is the print adviser, and assistant professor Mary Cox is the adviser for web journalism and social media. Among the honors were first-place finishes in editorial writing and story illustration. 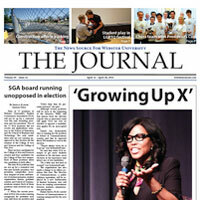 Overall, The Journal excelled in page design, sports writing and photojournalism. The Journal’s website received a second place award. Read more about the awards and see a list of individual journalism student writing, design and cartoon award winners and categories in this story at the School of Communications site.